We go through a pretty fair amount of hummus at our house, especially since we’ve been trying to eat less meat. I eat it with veggies or pita chips a lot as a snack and Betsy uses it on sandwiches sometimes. Hummus is good for so many reasons. First, it’s good for you. Second, it’s really easy (and fairly economical) to make. Third, you can add all kinds of delicious stuff to it to spice it up if you get bored with the standard. For these hummus varieties, I added some beets to one and a few roasted red peppers to the second batch. Can you guess which batch had the beets? After that you can go a bit crazy with ingredients. This first hummus I made is pretty standard and you can buy it in your grocery store. It’s better (and I think cheaper) if it’s homemade! Hummus made in two varieties. 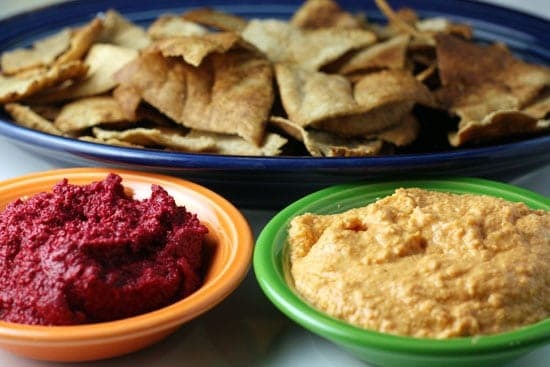 One variety is with roasted red peppers and the second has beets which give the hummus an almost sweet flavor. 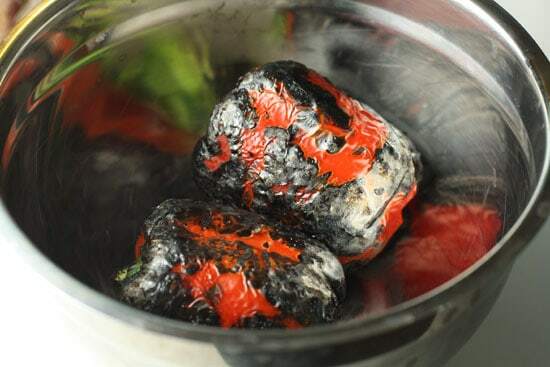 1) For red peppers, either buy jarred roasted red peppers or roast your own on the gas stovetop or on the grill. Just crank the heat up to high and set the peppers right on the burner. Turn ever minute or so until the peppers are very charred. 2) Let peppers rest, covered, in a bowl for 10 minutes. Then rub off most of the skin. 3) Remove the seeds from the peppers and chop roughly. Then add to your blender or food processor. 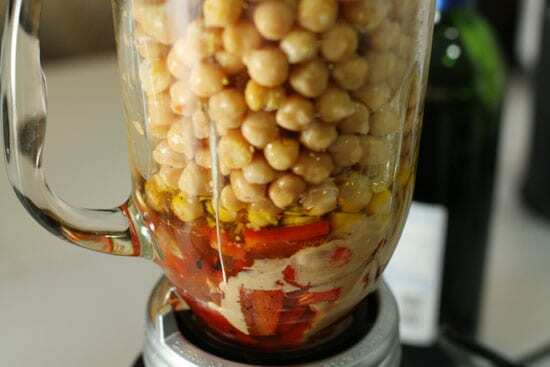 4) Add all your other ingredients and blend until smooth. You might need more olive oil to get the right consistency. Just adjust as you go. 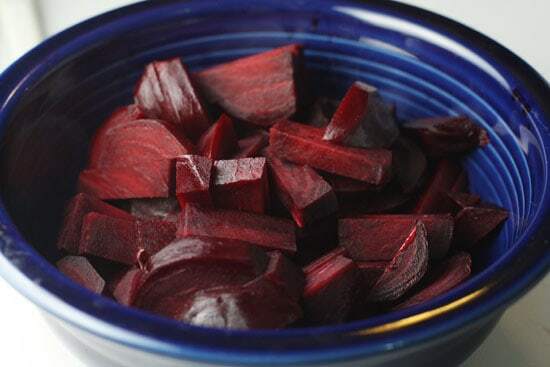 5) For beets, trim off any stems and boil them until they are very tender, about 30 minutes. Then drain and let them cool and then peel and dice the beets. 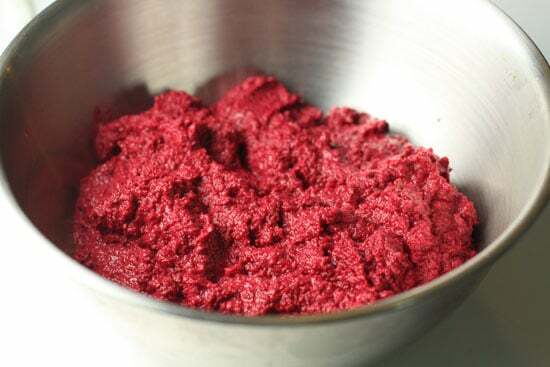 6) Add all the beets and other ingredients to a food processor or blender and process until smooth. 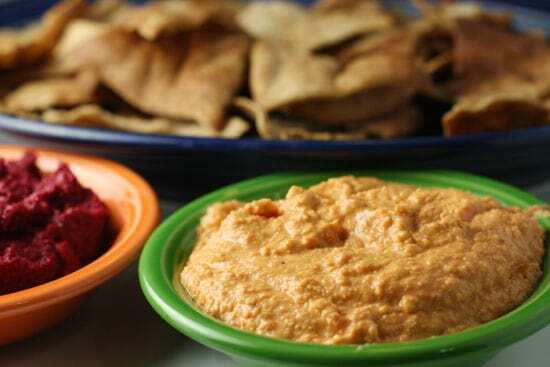 7) Serve either hummus with pita chips or pitas. Both versions are also great on sandwiches. They will keep fine for 10 days in the fridge. The only hard part about this recipe is roasting the peppers (it’s not that hard people). You can buy jarred roasted peppers that will work perfectly for this. 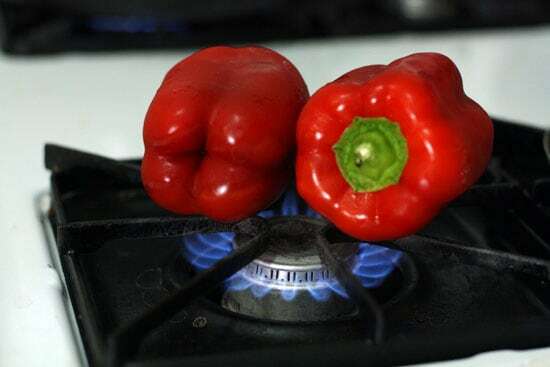 If you want to do some DIY peppers though, just crank up your gas stove to high heat and carefully set the papers on the burner! And yes, this will only work with gas. Turn them with a good pair of metal tongs every 30 seconds or so to make sure they are evenly roasted on all sides. They’ll probably take about 5 minutes to get nice and charred. They should be almost completely black when they come off. Put your peppers in a bowl and cover them with plastic wrap. The heat from the peppers will steam off the skin so it’s easy to remove. Let them sit, covered, for about 10 minutes before trying to peel them. When peeling the peppers, gently pull off the skin. It should come off really easily. It’s okay if you don’t get it all. I don’t like to wash my peppers because it washes away all the flavor, but if for some reason you wanted them to be perfectly clean, then wash them I guess. Next cut out the seeds and roughly chop them up. Add everything to your blender or food processor! Lots of flavor in there. Note that if you’re using a blender, it’s going to be slow going. 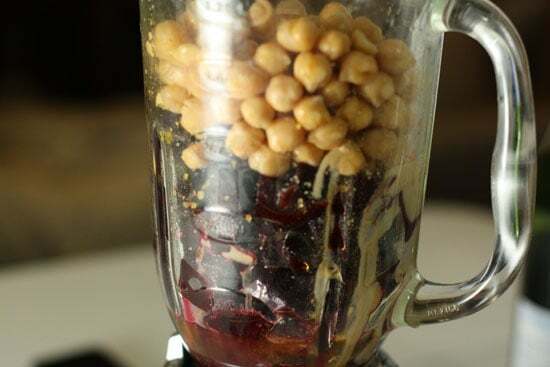 Hummus just isn’t quite liquid enough to blend perfectly, but you can use a spoon to stir up the ingredients or add a bit more olive oil to get a nicely blended result. This took me a few minutes and a few stirs… not a lot of work for a lot of hummus. Good with all kinds of stuff. The first time I saw this I knew I had to try it right away. The original recipe didn’t have any chickpeas in it though so I modified it because, to me, without chickpeas it’s not really a hummus. Besides the beets, I think the lemon zest and juice is the most important part of this recipe. The citrus flavor it adds is fantastic. You’ll need a good microplane zester though for the zesting part. Like with the roasted peppers, the prep of the beets is the only hard part really. 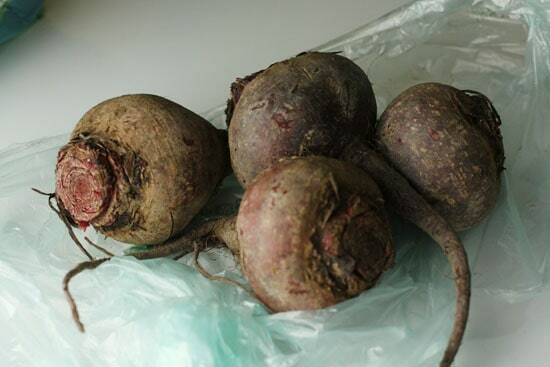 Start with 4 medium-large beets. No need to scrub them or anything like that but trim off any stems that are attached. Boil them for about 30 minutes until they are very tender. Then drain them and let them cool a bit. You should be able to very easily pierce them with a fork or knife. Once they’re slightly cool, peel the beets and cube them up! And yes… they will stain your hands. It can’t be helped. Once your beets are ready, stuff everything in the blender and it’s the same story as the red pepper version. Just pulse up everything until it’s nice and smooth. The end result will be very colorful! Umm… can you say colorful?! You could serve either of these with a variety of things. Cucumbers with the beet hummus was very tasty and the red pepper hummus goes great on a sandwich or on some carrots. Pita chips, however, go pretty well with both versions. You can definitely buy these at the store, but you’ll get more bang for your buck if you make them from fresh pita which is a lot cheaper. Just take your pita, cut it into sixths, and peel apart the layers. So you end up with 12 chips per pita. Then spread out all the pita chips on a baking sheet. I can usually fit about 4 pita’s worth of chips on one sheet. Sprinkle with a Tablespoon or two of olive oil and a pinch of salt! Bake those for about 15 minutes at 350 degrees, turning once just to make sure they cook evenly. Then let them cool and they should crisp up perfectly! I liked both, but loved the red pepper. The beet variety was interesting. It had a pretty sweet flavor to it which was good, but I couldn’t eat a whole bunch of it. Meanwhile, I could eat my own weight in the red pepper variety. That’s just my personal tastes though as I thought both versions turned out really great. You can store these in the fridge for a week without a problem or freeze them if you make sure to put them in an air-tight container and put a layer of plastic wrap on the surface of the hummus so it doesn’t get a film on it. Do you have a favor hummus flavor? Leave a comment! The best hummus I ever made was from Paula Wolfert's recipe, which calls for a staggering 1/2 cup of lemon juice. I may have even added more, but I'm a citrus fiend. She also has you cook dried chickpeas instead of using canned, so they're warm when you blend them, and if you've never had warm-from-the-food-processor hummus, then dude, you are missing out. I can see how that would rock. I'll check it out. Thanks! I have been reading your blog now for several months, and have learned many things from you. 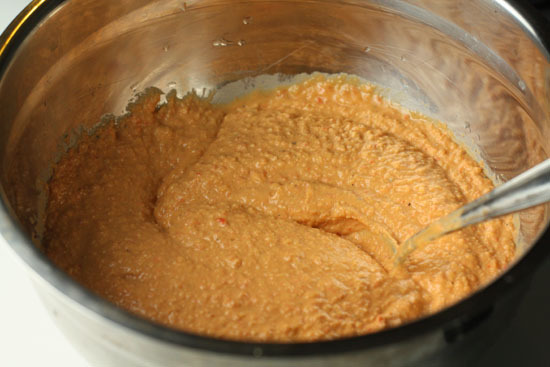 I love me some hummus, but have always been afraid to make it on my own (not sure why, I guess I'm just a wimp) but after just seeing pictures of that roasted red pepper one, my mouth is watering. The Cheerios just aren't cutting it right now! You can do roasted red peppers with an electric oven…you just need to broil them for a minute or two on each side. Gets the same charring as the gas burner! Love your website, have been sifting through all the old posts and have earmarked quite a few to try! Nick, do you have any good recipes for Pesto?? I've always wanted to make it but havent found any good ones. Thanks! There’s some great comments in that post also on variations and storing tips. thanks so much this looks great! We pretty much use the same recipe as yours but alot less cumin and twice the garlic. Now on fourth (and so far fave) version that has a generous 1/2 cup of balsamic caramelised onions stirred through it – seriously delicious on boiled new potatoes. The harissa-spiked one was good too. Looking forward to trying your red pepper version very soon. in the latest issue of food and wine, they make a hummus out of lentils, instead of garbanzos. i’m interested to try it. Damn you Macheesmo blog! I bought the ingredients for hummus this week. I thought I was all set and now you throw beets into the mix!! Now I have to go back to the store, grumble, grumble! All teasing aside, I have never thought to do beet hummus, it really looks delicious!! I’ll probably wait for grocery day, but I do want to try it out. We didn’t really care for the store-bought variety, but I’d be interested in trying home-made. Is it significantly better when you make your own, or just slightly better? I thought it was better than most store brands I’ve had. I can’t remember the name (helpful I know) but there is one brand of fairly decent red pepper hummus that I like. What a coincidence – I made a big batch of hummus yesterday. I roast a couple of heads of garlic and add those and jarred red peppers to mine. Really yummy! 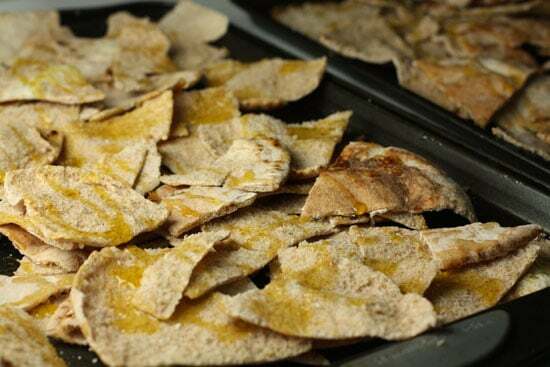 Pita chips are quickly baked up and everyone’s in heaven. We make our own tapenade too, using an Emeril recipe with anchovies and a bit of brandy. The beet hummus makes a spectacular show. Good for entertaining. A carrot slathered with hummus is my favorite snack.